Dino Storm experienced heavy media coverage over the last months, even while it still has been in early development. Both players and journalists are excited about the uncommon but undoubtedly charming massively multiplayer game. We are absolutely overwhelmed by the feedback. The Massive Online Gamer Magazine wrote: “This Will Keep Everyone Entertained at Least Until the Asteroid Hits”. No asteroid in sight. Now, dinosaurs and rangers are preparing for their first missions for the well-being of DinoVille. We are currently working on the game content and visuals. The graphics are amazing and we’ve shifted the game into a new direction that we think you will love. Heavy action, tons of items, many dinosaurs, beautiful environments and exciting adventures are waiting for the brave rangers. We can’t wait to open the gates for you. At the GamesCom 2011 in Cologne, game industry professionals will get the chance for a first “hands-on”. 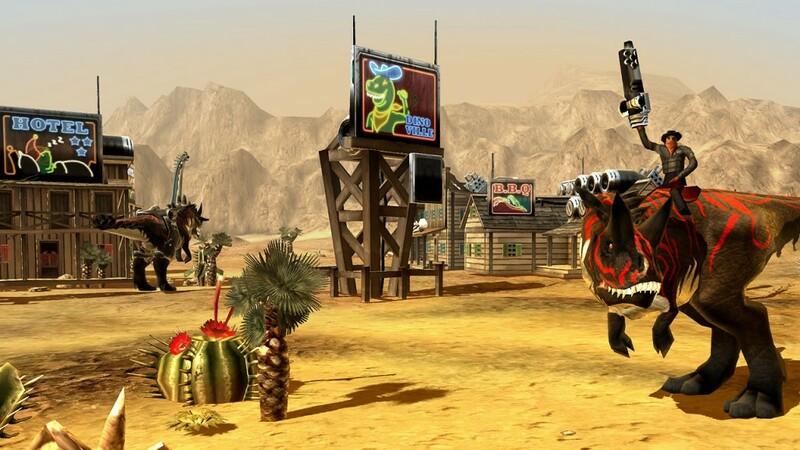 Shortly after expect the first players to be invited for their journey through the town of DinoVille, starting their fervid hunt for the baddest hombres the Wild West has to offer. To secure your chance to be one of the first rangers in DinoVille, just register on this site and post a comment, what you are looking forward to the most. If you already own a Splitscreen account, you don’t have to create a new one of course. We working at full throttle to get Dino Storm into Beta and are already looking forward to test the game with you. Your Dino Storm team.